Raumfahrt+Astronomie-Blog von CENAP - Blog: Astronomie - Kepler findet erstes bekanntes geneigtes Sonnensystem - Beobachtungen zeigen zwei Planeten welche ein Stern in einem 45-Grad-Winkel umkreisen. Observations from NASA's Kepler spacecraft have uncovered a 'tilted' solar system, a finding that gives clues as to how some planets come to orbit their stars on paths that are misaligned with the stars' equators, astronomers report today in Science1. Five years ago, however, astronomers were shocked to find planets orbiting at steep angles to their stars’ equators2. 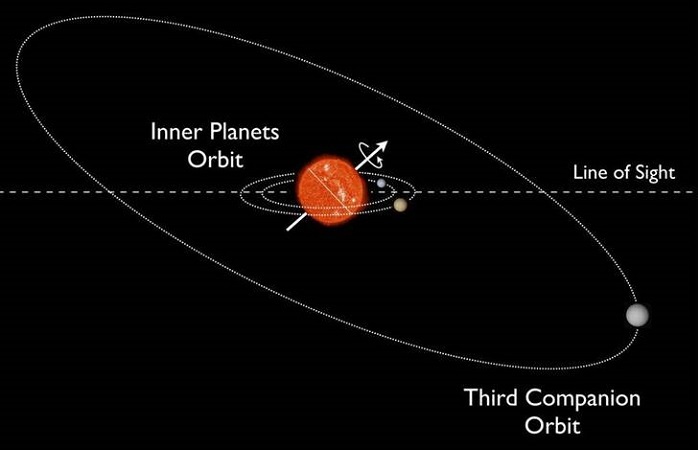 Some planets even went around their suns backwards — they orbit in the opposite direction to the star’s rotation3. But no one had seen a misaligned multiplanetary solar system until now. For the latest study, astronomer Daniel Huber of NASA’s Ames Research Center in Moffett Field, California, and his colleagues looked at Kepler-56, a star roughly 860 parsecs (2,800 light years) from Earth. It has two large planets that lie in the same plane4 and circle closer to their sun than Mercury does to ours. Kepler detected the planets as they blocked the star's light, so their orbits are oriented edge-on to our line of sight.